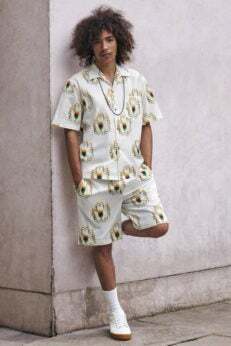 With her quiet luxury, dedication to animal rights and sustainable fashion, effortless style and signature playfulness, Stella McCartney designs a collection for the man who stands next to the Stella McCartney woman. Focusing on classic pieces with a creative twist, the collection includes suiting with unusual proportions, tailoring, wide variety of knitwear, outerwear handmade in the UK, graphic tees and sporty accessories. Recycled nylon, organic cotton and regenerated cashmere are but a few of the sustainable elements in the collection. These modern sneakers by Stella McCartney are ready to add punch to a city outfit or to head off on vacation. White alter nappa sneaker. Wear with crisp linen or shorts. Show a wild side with these fun slip-on Daydream Sneakers. Thoroughly modern; black with contrasting embroidery.